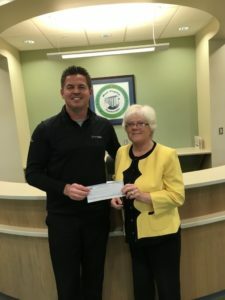 Sharon Walls, District Manager from Wendy’s Corporation presents a check to Michael Green, Executive Director New River’s Foundation for the Wendy’s Adoptions Scholarship. Why does a public college require private support? – Once able to rely on state funding and tuition dollars for the majority of its revenue, New River CTC now receives less than 40% from state appropriations, and this number steadily declined over the past few years. Despite this, New River CTC is an institution of vision with vital human resources upon which the community, region, and state rely. Private support allows New River CTC to be innovative in its plans and to secure and promote its position as a leader in the state and the region. Corporate support helps fund scholarships, new facilities, professorships, and programs. The external relationship with local, national and international corporations not only contributes vital financial support to the College, but also offers corporate donors reciprocal benefits above and beyond a simple tax benefit. Today’s New River students are tomorrow’s workplace leaders. A partnership with New River provides opportunities for corporate entities to have access to tomorrow’s leaders in business and industry. Corporate partners can help develop solutions for challenging issues by funding initiatives, providing professorships and scholarships, and helping to purchase equipment and facilities. They can maximize marketing funds to align a corporate message with a giving opportunity at the College, being showcased in local, state and national media, as well as College communications.